“Rachael, this place is NOT big enough. You’re going to have to do something. You’re simply going to have to switch buildings,” begged my husband last September. “No, I’m sure if you just build me some more shelves, that I’ll be able to get it all to fit,” I responded ever so confidently. We had tubs of fabrics everywhere. By the end of October, I was confident he had been right, and by mid-November, I knew that there was no way that we could continue to grow in our current facility. When I realized how futile my efforts were I had even stopped putting the fabrics on the shelves, knowing we'd just have to pull them back down. All but the impossible to reach units were filled to the gills. 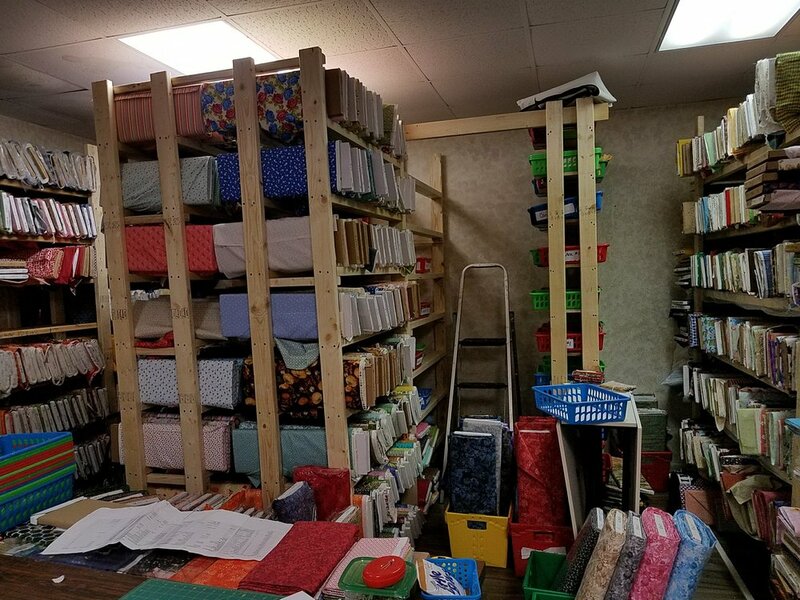 When we weren’t putting up fabric, we were cutting it up into half yard and fat quarter packs as fast we could, but found ourselves having to move tubs of fabric out of the way continuously, in order to be able to reach the shelves we needed. Overflow had filled my house so that couldn’t walk through it. has become a storage unit and holding spot. Consequently, on Friday, Dec. 8, I had a meeting with our ladies from TheCouponClippers.com and told them that we had to move to the unit that was less than half the size of their current facility because I needed it for the fabric store. Thankfully, they jumped in willingly to help. By the end of the first day, they had culled through their wall units housing extra empty purple envelope boxes for inventoried coupons and downsized to less than half of their storage of extras, so they would fit into the smaller building. They emptied their shelving units and that same day, by 2 p.m., we had started the move. On Friday afternoon I found myself flattening what seemed like hundreds of empty cardboard boxes that had lived a life first as a box of envelopes and then had been recycled into storage for overflow coupons. These were no longer needed. Behind the pile of boxes, you can see the first two empty fabric shelves moved into position, ready for fabrics! Having two businesses where both have a lot of “stuff” and they needed to switch places while still both being 100% operational is quite the feat. Plus, we were using the larger store front to store excess staging materials for our houses that we fix and flip, so all of that had to go, as well. I had laid out a plan at the beginning of November, as to how to accomplish this very gradually, but, of course, other things had come in and taken our employees’ time, so none of the prep work had begun. However, when my ladies at TheCouponClippers.com tackle a task, it’s “done.” Just say the word… DONE. They were only slowed down by our age (50’s and 60’s) and our waiting for shelves. I’m glad we had to wait for shelves or we might have killed ourselves. I found myself flattening lots and lots of cardboard boxes so we could put them into the dumpster. But, of course, the dumpster was full. I filled 3 large blackbags and set them aside, hoping to catch the dumpster right after it was emptied. Here are the units they emptied, now filling the middle floor space, instantly creating a traffic jam there. We simply had a lot of "stuff" in this larger unit. But, with the other one stuffed to the gills with fabrics, there was NO way to bring anything into the smaller unit until we had moved some of it out, into this larger one. I was all psyched up to come in on Saturday and start filling the units in the larger facility. This would require my taking them down from the shelves in the facility two doors down, putting them into tubs, carrying them out the back door of the office, putting them into my vehicle, driving forward 105 feet, removing them from the vehicle, entering the back door of the larger office, then carting them over to the wall, and hefting them one bolt at a time to the top of the 7 foot tall bookcase. and when I came back a couple of hours later, some of it had peeled off... sigh.. However, when I started to touch the shelving units, I realized that they were super rough, and had to be covered all with duct tape before I could put any fabric on them. So, on Saturday, in between working coupons and fabric orders, and some church visitation, I got all the shelves taped up and prepared for filling on Monday, Dec. 11, 2017. Some of the duct tape I had put on early in the day had peeled off, but I just pushed it on harder. I didn't realize that duct tape and wood aren't as good of friends as duct tape to duct tape!. Little did I realize how much patience would be required from me to get that simple "filling" task completed. Here are my shelves, ready for filling and the first of the fabrics, ready to be put up! Oops. Forgot a tall step stool. I had to buy one of those when I was getting more duct tape! But, that’s ALL I got done. (My goals were much, much larger than that!) Over the next few days, I would have to come to realize my own physical limitations and that my goals and my body's abilities were not always on the same page... ... but for now, coupons and the beginnings of fabrics were co-habitating nicely. "You NEED more space.," he says as he is standing in the oversized bathroom turned into fabric storage!